The Union League of Philadelphia, ranked the #1 City Club in the Country, is a shining jewel of history in a city defined by such treasure. Founded in 1862 as a patriotic society to support the Union and the policies of President Abraham Lincoln, The Union League of Philadelphia laid the philosophical foundation of other Union Leagues across a nation torn by civil war. The League has hosted US presidents, heads of state, industrialists, entertainers and dignitaries from around the globe and has proudly supported the American military in each conflict since the Civil War. 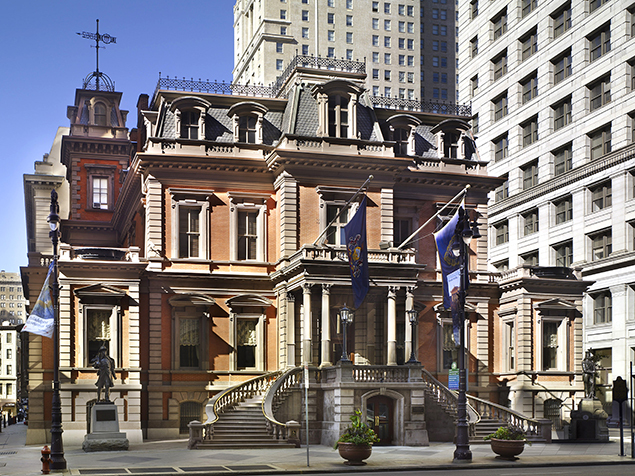 The Union League continues to be driven by its motto, Amor Patriae Ducit or Love of Country Leads. The League House occupies an entire city block in the center of Philadelphia's commercial and cultural district. The building is representative of the classic French Renaissance style, with a brick and brownstone façade and dramatic twin circular staircases that lead to the main entrance on Broad Street. Built in 1865, the building was added to the National Historic Register in 1979. Approximately one-quarter million square feet in size, the building is spread out over eight floors and has entrances on all sides. Inside, the traditional décor is accented in rich leather, patinated wood and polished marble. The League's distinguished collection of art and artifacts adorns the walls and hallways. The collection is a rich chronicle of Philadelphia's unique imprint upon the American landscape from the 19th century to today and is recognized by historians and art experts as a valuable component of American history. Today, the Union League is home to over 3,500 men and women who contribute to club life and keep alive the League's traditions. As they did in 1862, today's members represent the Philadelphia region's leaders in business, education, technology, healthcare, law, government, religion, art and culture. The League's civic participation and philanthropic outreach takes the form of three charitable foundations: The Youth Work Foundation, The Scholarship Foundation and The Abraham Lincoln Foundation, which educate the public about our nation's history, recognize student role models in our region's schools, and provide scholarships to deserving students. Privileges of membership include access to the League's facilities: three dining rooms each with distinct style and cuisine (Café Meredith, Founders and 1862 by Martin Hamann); fourteen unique banquet and meeting spaces managed by a professional private dining staff; an Executive Fitness Center with state of the art CYBEX equipment and personal trainers; two Business Centers; a 25,000 volume library with current best-sellers, periodicals and DVD’s; and the Inn at the League, an 84 room hotel for members and their guests. The League also owns and operates the parking garage on Broad and Sansom Streets. 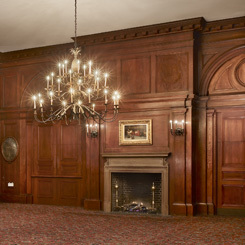 In addition, the League has four satellite facilities exclusively for members - The Union League Golf Club at Torresdale located in Northeast Philadelphia, The Bungalow, a private dining room, located in Stone Harbor, NJ, The Union League Guard House, a private dining room in Gladwyne, PA and Union League National Golf Club located in Swainton, NJ. Members participate in many League-wide events each year, including formal dances, dinners, speaker programs and outings, and enjoy reciprocity with more than 200 private clubs around the world.